The Irish Way: Becoming American in the Multiethnic City. By James R. Barrett. New York: Penguin USA. 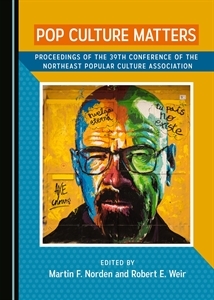 ISBN: 978-0-312280-7. James Barrett, a history professor at the University of Illinois at Urbana, reminds us that the Irish were “America’s first ethnic group” in the sense that they were the first ”diasporic people” (3), unlike most of British and German immigrants that preceded them. One might take umbrage with that claim, but he’s correct about how the Irish were received. To be seen as “ethnic” by definition involves being viewed as the “Other.” Tales of anti-Irish discrimination abound in United States history, but Barrett has a different story to tell: the process of assimilation. He concentrates on second and third-generation Irish Americans, mostly (though not exclusively) in Chicago and New York, as they wended their way through the Americanization process. The three-generation assimilation model is fairly standard among immigration and urban historians, and more has been written on the Irish than any other U.S. ethnic group other than African Americans. 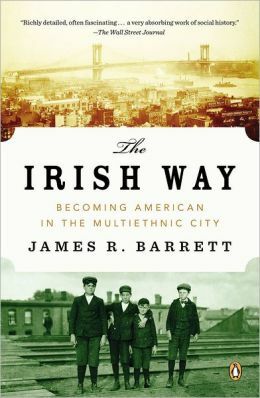 Barrett makes his most original contribution in writing–as his title implies–a multiethnic study that shows how Irish American identity was forged through interactions with other ethnic groups. His warts-and-all approach leaves the praise to nostalgic romantics; Barrett is quick to admit that Irish-American identity resulted as much from conflict as from cooperation with non-Irish groups. He also acknowledges that the “American” part of the equation “was partly a coercive process” (3) imposed by middle-class WASPs, settlement house workers, and employers. In other words, assimilation was neither certain nor easily accomplished. It was complicated further by its setting: 19th century American cities, which were themselves works in progress. In succeeding chapters Barrett highlights the various arenas in which the Irish became American: the street, the parish, workplaces, stage and screen, and in politics. Only after navigating obstacles in each setting–progress often stymied by exclusionary roadblocks, limiting stereotypes, interethnic clashes, and poverty–does it makes sense to address the place of the Irish within the larger nation, Barrett’s concluding chapter. As noted above, so much has been written on the Irish that it’s hard to write a revelatory work on them. That’s not Barrett’s intent. What we get is a readable 290-page overview of the Irish-American experience that makes a worthy addition to Penguin’s “History of American Life” series, and would work very well in an undergraduate classroom. Unlike weaker looks at Irish Americans, Barrett treats them in context rather than isolation. How they got along with Italians, Poles, African Americans, and Jews was central to what it meant to be Irish American. This is a nice corrective to Noel Ignatiev’s otherwise excellent How the Irish Became White (1995), a seminal work that tends to view the Irish as overcoming otherness though tightly defined in-group activities that excluded competing ethnic groups. An additional contribution is the way in which Barrett situates the three-generation assimilation model across time. Immigration narratives are sometimes reductively told as if a group arrives, endures first-generation struggles, and then begins to move up the social hierarchy when replaced at the bottom by newcomers. Such a view incorrectly implies that migration waves come within specific time windows that subsequently close. This is true of peak migration–the Famine years of 1845-52 for the Irish–but about a quarter million Irish came to America during the Colonial period, and more than two million came after the Famine and before the Immigration Act of 1924, the endpoint for much of Barrett’s analysis. As Barrett is quick to point out, Manhattan, Brooklyn, and Chicago contained more people of Irish extraction than all of Ireland. This begs the question of the essential nature of Irish culture. Is it found in County Cork, or Cook County? Moreover, because the Irish continued (and continue) to come, can Irish culture or Irish American identity be considered as anything more than fluid entities subject to periodic reinterpretation? To be clear, there’s not much in Barrett’s book that will surprise Irish Studies scholars. Its major values lie in synthesis and the volume’s utility in the classroom. Both efforts are to be applauded. The next time I need a work on Irish America for an immigration history class, this will be the one I will select.